Cooked organic red kidney beans with no added salt or sugar. 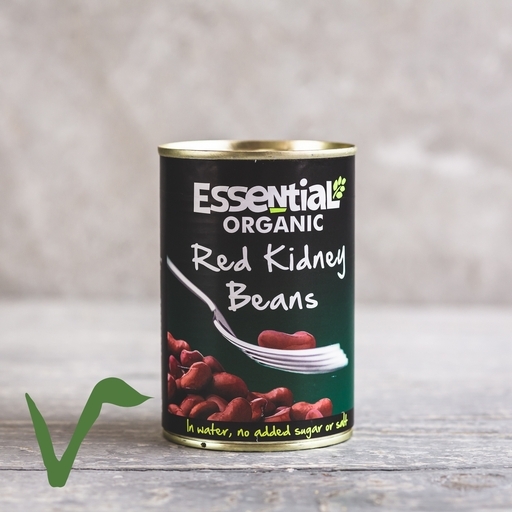 With soft, creamy flesh and oodles of nutrients, kidney beans are a good standby to have in the cupboard. As these are pre-cooked, they’re ideal for flinging into weeknight suppers; it’s fast food with a difference. Kidney beans are central to a chilli con carne or a vegetarian chilli beanpot. Add to veggie burgers, mash into a nut roast, or fold into sweetcorn burritos or enchiladas. Kidney beans are central to a chilli con carne or a vegetarian chilli beanpot. Add to veggie burgers, mash into a nut roast, or fold into sweetcorn burritos or enchiladas. You could include a can in your bolognese to cut down on the amount of meat. They’re also ideal for fresh salads or salsas. Unopened kidney beans can be stored indefinitely. Once opened, don’t keep your beans in the tin – turn them out into a covered bowl and they’ll last for 3 or 4 days in the fridge. They can also be frozen, though their texture becomes a bit mushy when thawed, so they’ll be better for stews than adding to salads.